Staff will receive training by fully qualified trainers experienced and specialising in the health and social care sector. Our network of accredited training providers understand the specific needs of the different industries and deliver practical training that has been tailored for workplaces like yours. Do you need a training solution for your organisation? 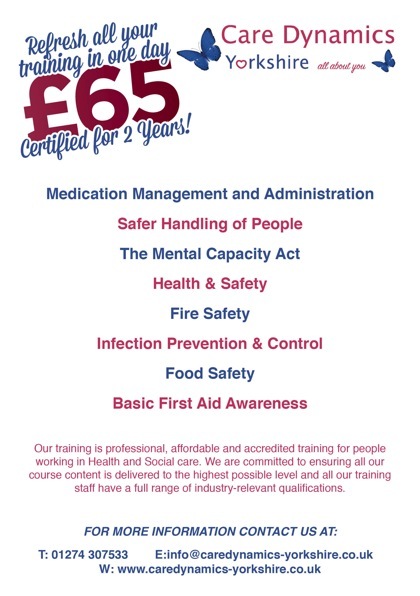 Train and develop your staff with our range of training courses. Fun practical and relevant for workers at all levels. Medication: controlled drugs, legislation, administration and management, accountability. Moving and Assisting: risk assessment, anatomy, object handling, practical techniques. Other specialist training can be provided, from care-related courses such as Positive Behavioural Support Awareness and Physical Intervention or Dementia Awareness through to specialist courses such as Epilepsy with buccal Midazolam or PEG Feeding. CDY specialise in delivering a wide range of primary care training courses and development programmes to meet the needs of people and organisations in the Care Sector. We can also tailor, adapt and create special training courses / programmes to meet specific needs. We constantly improve our programme content, delivery methods and skills through regular research, feedback and evaluation.